Weekends are my favorite time to bake. As soon as I get up and make my green tea, I start puttering around in the kitchen. With breakfast on my mind I remembered that I was out of my giant breakfast cookies so they were first on my list. This time I used a mixture of prunes and figs and added a few extras chocolate chips. I baked them for 14 minutes so they turned out more crispy than usual. I often have one of these yummy cookies after breakfast but I also have them for dessert. 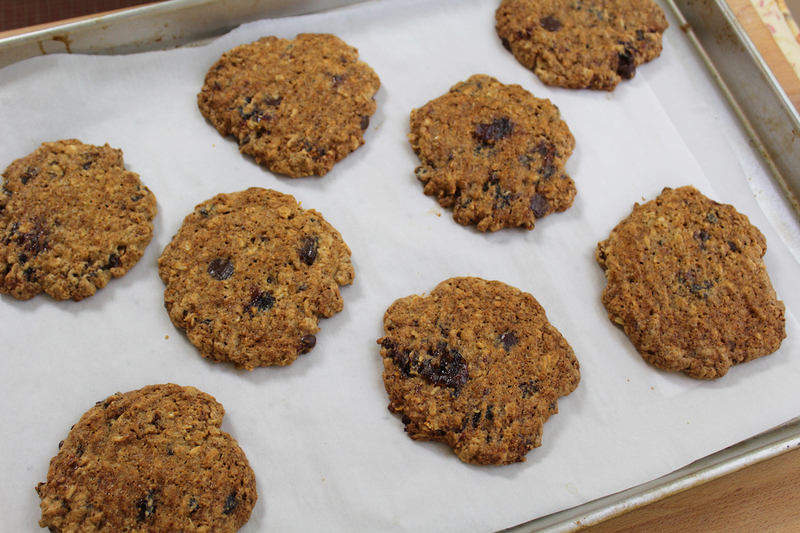 There are 4 grams of fiber in each cookie! Click here for my recipe. 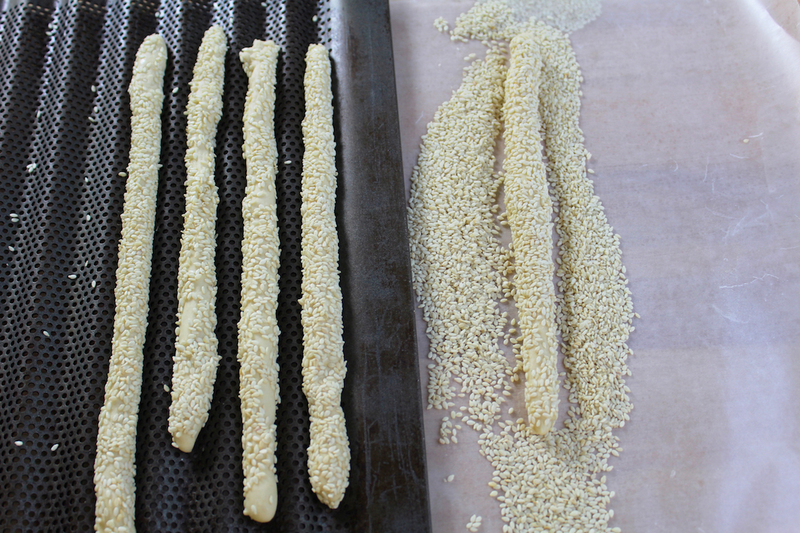 Next, I started my sesame see breadsticks. I just ran out of those too and I hate to have my salad without those crunchy breadsticks. I make them so often that I got a breadstick pan with holes to help them bake from the bottom. There’s no place I know where you can buy fresh breadsticks like these so I make them at least twice a month. This picture was taken before I put them in my warming drawer to rise. Click here for the recipe. While the breadsticks were rising and the oven was already hot, I saw that I was down to one granola bar so I made more of those too. It’s the easiest recipe – just mix everything in a bowl and bake. But you do have to press down really, really hard before baking to keep the bars together. I use a spatula that I press down onto the bars before baking and I press all over for about a minute so they set well while baking. 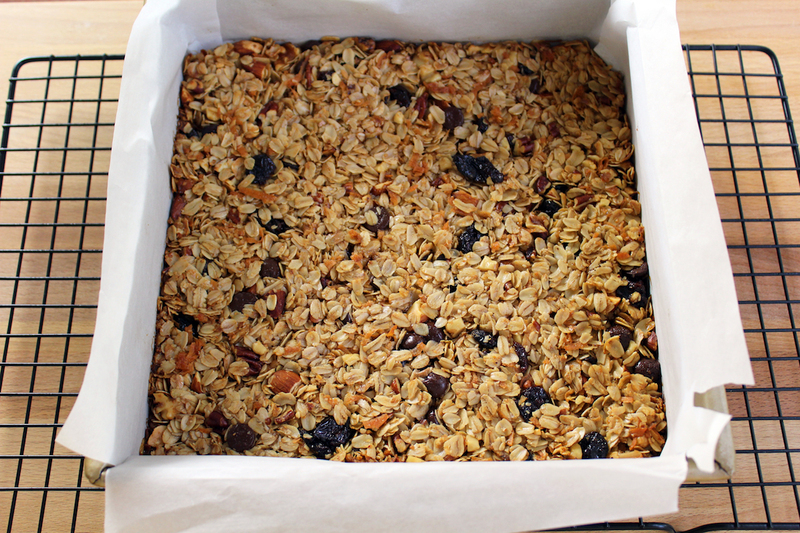 Oh, I almost forgot – there’s another granola bar in my purse (I always carry one just in case). Click here for my easy recipe. 2 Comments on "Weekend Baking"
You haven’t done any videos in quite a while, but I notice you’re posting on your blog. I hope nothing is wrong preventing you from doing your videos. 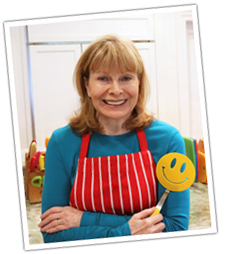 I miss your recipes….they’re always easy to make, they have very few ingredients, they take very little time to make, and as an added plus, your humor is always a good thing. I don’t think I’ve ever watched a video without laughing at your actions, at your jokes, or both. Hurry back with the videos. We miss you!!!! These look absolutely lovely Jenny! Guess what I made for my mom..peach cheesecake 😀 I’m so glad you are still posting your blogs even though you haven’t been active on your YouTube videos..Have a great day Jenny!